Many-Flowered Ixora is a small shrub, with hairless branches. Leaves are 10-30 x 4-12 cm, obovate to broadly oblanceate, pointed or long-pointed, short-stalked, stipules long cuspidate. Flowers are borne in large, 7-12 cm broad, corymb-like cymes at branch ends. 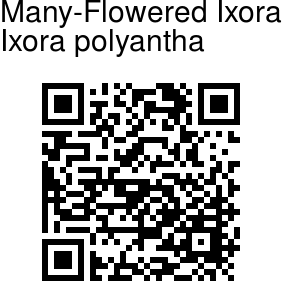 Flowers are white, bracts about 3.5 mm long, falling off, bracteoles linear, long-pointed. Sepal tube is short, about 1.5 mm long, sepals more than twice as long as the ovary, ovate-lanceshaped, pointed, hairless. Flower tube is 2.0-2.5 cm long, hairless, petals about 6 mm long, turned back, mouth hairless. Anthers are linear, about 2.5 mm long. Stigma branches are recurved. 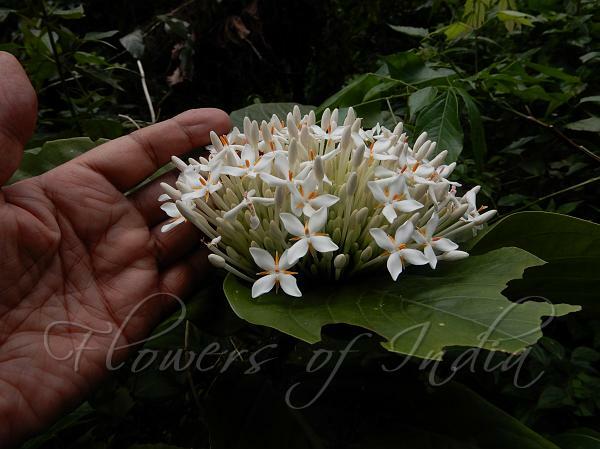 Many-Flowered Ixora is endemic to Western Ghats. Flowering: March-July. Photographed along Kumta-Siddapur Road, Karnataka.